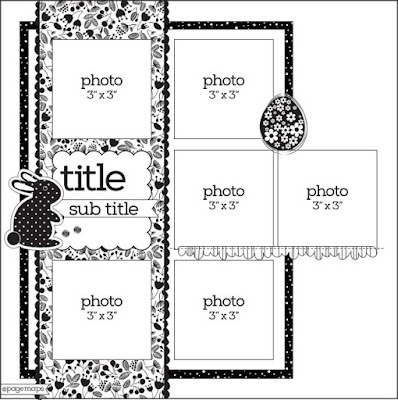 A layout sketch is a great way to kick off your creative foundation for your scrapbook page. You can either follow a sketch closely or use an element in the sketch for inspiration. In this sketch created by Becky Fleck of Pagemaps, I was drawn to the 7 grid design and used this as the basis for my layout. I opted to substitute the two placement of photos in the vertical column for a journaling and embellishment blocks. In addition to the beautiful pattern papers in the Hello collection, I chose the yellow Petite Prints papers as the base for my page. It's a great alternative to using cardstock and they are available in all sorts of delicious Doodlebug colors! Check out the awesome Polaroid doodepop, the photo print out is so life like, love love love! In my title I opted to keep some of the negative fillers in my letters, just a fun way to make it a little different. I think I've mentioned this before I am so crushing on this Hello collection, this collection is wonderful to scrapbook any occasion. I love the teal and navy combination and the shine of gold foil is the icing on the cake! Absolutely fabulous layout!!! I love a good grid! wow--love the layout!! That collection is awesome!